Summerhill in East Herrington, Sunderland. Copyright Google Maps. Tyres on a number of cars parked in a Sunderland community have been slashed by yobs. Several residents living in the East Herrington area have reported the vandalism to police. Owners of vehicles in Summerhill and St Chad's Crescent have been left counting the cost of the damage. It is though the tyres were slashed sometime between 5pm yesterday and 6.30am today. 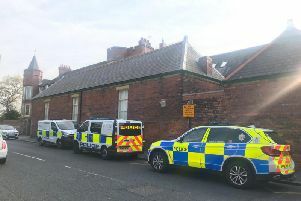 A Northumbria Police spokesman said: “We are investigating a number of reports of damage to motor vehicles in the Summerhill and Saint Chad’s Crescent areas of East Herrington, Sunderland. “A number of parked cars had their tyres slashed between 5pm yesterday and 6.30am this morning. “An investigation has been launched to trace those responsible and there will be increased patrols in the area as officers carry out enquiries and offer reassurance." Anyone with information in relation the vandalism is asked to contact 101 quoting reference 112 280119 or Crimestoppers anonymously on 0800 555 111.